George R.R. Martin’s epic-fantasy setting of Westeros is highly addictive, and for good reason. It’s such a richly imagined world, with such a rich backstory, there’s enough material to obsess about for years. And his new book, collecting his “Dunk and Egg” stories, showcases just what a great setting it is. 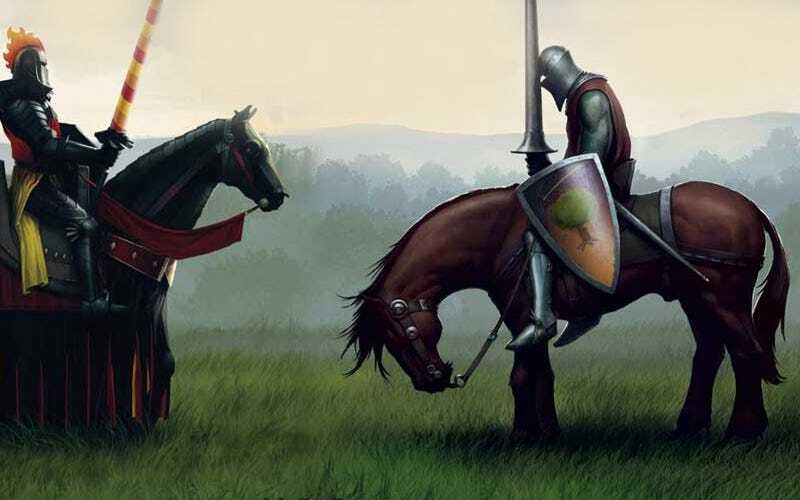 Martin’s new book, A Knight of the Seven Kingdoms, collects three novellas that were previously published, starring Ser Duncan the Tall (aka “Dunk”) and his squire, Egg. These novellas only appeared before now in various anthologies that Martin co-edited, so it’s great to have them all in one place at last. The “Dunk and Egg” tales take place roughly a century before A Game of Thrones, and they show us Westeros (more or less) at peace, in contrast to the wild and turbulent version we’re seeing in A Song of Ice and Fire. And the big twist of these stories is that Egg, the squire, is actually Aegon Targaryen, Daenerys’ great-grandfather, who is destined to sit on the Iron Throne as King Aegon the Unlikely. I won’t give away much of what actually happens in these stories, and the plots aren’t really the point anyway. The point is the relationship between the impoverished hedge knight Dunk (sometimes called “Dunk the Lunk”) and his secretly royal squire, as they travel around trying to do the right thing and make a few coins here and there. Even though Egg is actually a prince and entitled to fancy treatment, he and Dunk wind up sleeping in ditches a lot of the time, and there’s a great “underdog” feeling to these stories that will feel very familiar to fans of Firefly and other stories of honest rogues. Dunk isn’t the best knight in Westeros, or the smartest, or the best fighter—he loses as many fights as he wins, in fact. But he always takes care of Egg, no matter what, even if he also threatens to clout Egg in the ear on a very regular basis. Fans of the relationship between Brienne and Pod will also find a lot of the same wry, embattled cameraderie and humor in Dunk and Egg. The best story of the three, in fact, is probably the second one, “The Sworn Sword,” which is purely about Dunk and Egg facing a no-win situation in which everything turns out to be much more complicated than it first appears, and they still have to try and do the right thing, with increasing difficulty.This is actually the closest that Martin has come to showing what it’s like to be a member of the smallfolk in Westeros—the characters in the other books tend to be novel, or at least noble-adjacent, and the adventures of a character that absolutely everybody looks down on give us a whole new window on the Seven Kingdoms. You know that bit that everybody always references in Shakespeare’s Henry V where King Harry goes incognito before the battle and listens to ordinary soldiers talking about their hopes and fears? There’s a lot of that in the Dunk and Egg stories, too. Egg, undercover as a poor squire, is forced to listen to a lot of ordinary people’s opinions about the Iron Throne and his family members and politics, and sometimes it’s not what he wants to hear. And you also learn a certain amount of new stuff about the history of Westeros—and one event, in particular, hangs over the whole series. The Blackfyre Rebellion took place nearly a generation earlier, but for people who fought on the losing side it remains a major sore point. And even though this is a Westeros with a relatively stable government, the constant discussions of the Blackfyre Rebellion provide a way to talk about the same issues of succession and legitimacy that become such a huge issue in the main book series. And Martin’s preoccupation with the use and nature of power comes through strongly in these books, as Dunk and Egg discover firsthand what it’s like to be on the receiving end of unjust power. The fact that Egg can go back to his royal family and live in luxury again at any time does not change the harshness of the injustices that he and Dunk are subjected to—if anything, it only makes them seem more intense. More than anything, the Dunk and Egg stories prove that the star of Martin’s saga is not Tyrion, Jon Snow, Daenerys or any other character—it’s Westeros, the realm that’s full of rich history and packed with unforgettable characters. Edited to add: One thing I forgot to mention is the artwork by Gary Gianni, which adds a ton of vividness and humor to the procedings. He absolutely captures the whimsy and brutality of Martin’s writing, and manages to create the definitive versions of the main characters—the ones who you already sort of pictured in your head from the way that Martin described them. Even if you’ve read these stories before, it’s worth getting the book just to see the copious illustrations by Gianni.